Eighteen states and the District of Columbia have filed suit against Education Secretary Betsy DeVos over her delay of regulations meant to provide new protections for federal student loan borrowers, particularly those at for-profit colleges. 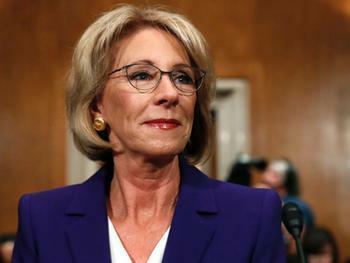 The lawsuit accuses DeVos of illegally delaying the regulations, known as the “Borrower Defense Regulations.” They were set to take effect on July 1, but DeVos announced last month that the Department of Education would refuse to implement them as part of a “regulatory reset” while looking to develop alternative regulations that would likely leave victimized borrowers with far less protection. Becerra said the refusal is a violation of the Administrative Procedure Act because the Department improperly relied upon a legal challenge to the regulations as a basis for delay and also failed to provide the public with the required notice and opportunity to comment on the delay. Becerra noted the case of California-based Corinthian Colleges, accused of targeting low-income, vulnerable individuals through false advertisements that misrepresented job placement rates and the value of school programs.